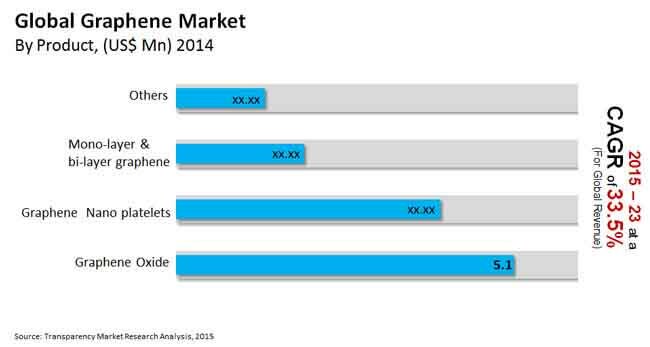 The global graphene market is fragmented with the top five companies accounting for 38.8% of the market in 2014. These companies are Graphenea S.A.,Applied Graphene Materials plc, XG Sciences, Inc., Grafoid Inc., and Graphene Frontiers LLC. Mergers and acquisitions are likely to alter the market shares of companies in the coming years. The lucrativeness of the market and the broadening scope of graphene in various end-user industries are expected to attract many new players in the future. Players are investing in research and development in order to create cost effective manufacturing technologies, states Transparency Market Research in its new study. The current threat of substitutes is moderate owing to the easy availability of low cost alternatives. However, the threat level will decrease significantly in the coming years. According to the report, the global graphene market is expected to rise from US$15.8 mn in 2015 to US$159.2 mn by 2023. On the basis of product, the graphene oxide segment is expected to account for 42.6% of the market by 2023. By end user, the electronics segment is likely to continue to lead, accounting for 34.7% of the market by 2023. On the basis of geography, North America, followed by Europe, will lead in the market. North America is projected to account for 42.1% of the market by 2023. Graphene is one of the lightest material, but is tougher than diamond, and stronger than steel. Players are therefore, investing in research and development on the use of graphene in various industries. Governments across regions are also funding the research and development on the use of graphene. “The results of these R&D have led to the finding that graphene has massive potential in the automotive industry,” states a TMR analyst. As the demand for light-weight vehicles is increasing, graphene can be used to manufacture light-weight automotive components. Recently, at the Geneva Motor Show, Spania unveiled its new GTA Spano, in which the chassis is built from graphene and titanium. The use of graphene has resulted in the high rigidity and lightness of the chassis, as per the company. One of the major challenges affecting the global graphene market is the difficulty in the commercialization of graphene owing to its high cost. Despite the many research and development activities being carried out, none of them have resulted in the development of cost effective technology for the manufacturing of graphene. Another challenge is the difficulty in the manufacturing of large quantities of graphene in various formats, keeping its purity intact. In addition to this, chemical vapor disposition (CVD), which is the most commonly used technology for manufacturing graphene, makes use of toxic chemicals. Hence, the manufacturing of graphene is not regarded as being entirely eco-friendly. Extensive R&D is being carried out on the use of graphene in mobile phones and memory chips. The use of graphene is expected to increase the storage capacity of smartphones. This is expected to be a boon for the telecom industry. In addition to this, touch screens made using graphene are expected to make them light and flexible, which is in contrast to the use of silicon, which is brittle and can break when bent. Owing to the demand for light-weight components that are stronger and energy efficient, the requirement for graphene is also likely to emerge from the aircraft industry.